We went to Twycross Zoo at the weekend. 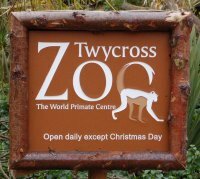 Twycross Zoo is within Warwickshire, but only just. It’s very near the border with Staffordshire. I have been to the zoo a few times before, my latest was about a year ago, when we went with children, this time we took our baby daughter (7 months old). We had wanted to take our daughter to see some kind of animals as she shows a great interest in the pictures we have, but thought it was a bit wet to visit a children’s farm which we plan to do later in the year. It may be the fact that we regularly make animal sounds when looking at pictures of animals (and we have some around the house), but despite being only a few months old she looks at them whenever she goes past. She was asleep for some of the time around the zoo, but when she was awake she took a great deal of interest looking at the animals. Twycross Zoo is famous for it’s collection of primates. This includes Apes, Monkeys and Lemurs. The smallest are some “little monkeys” little bigger than a gerbil, going all the way up to Orang-utans and Gorillas. The zoo is also home to a wide range of birds, including penguins and flamingos. The reptile house appears to have gone and now been replaced with a Tropical House (although we didn’t visit that when we were there). If you do plan to visit the Tropical House then you should get some (free) tickets after entering the zoo as they limit the number of visitors on the guided tours. There are also a variety of mammals including lions and leopards and some magnificent looking elephants. 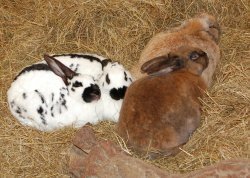 For the children there is a building with domesticated animals including rabbits and guinea pigs. Although it is possible to stroke some of these animals if they are close to the wall, children are not allowed into the enclosure which they are at some other zoos with petting areas. tables and chairs and highchairs available. Hot and cold food was available (although a wider choice is offerred at the cafe by the main entrance). The food was acceptable for canteen style food and reasonably priced. It was very cold on the day we visited and a hot meal in a heated cafe was very welcome. They had a microwave available for heating baby food. We have dropped milk from our baby’s lunchtime meal so didn’t need to get the bottle warmed up. There are baby changing facilities in both the ladies and disabled toilets allowing either parent to change the baby. Throughout the zoo there are references to the importance of the conservation work that they do, it stresses that zoos should be in addition to trying to protect the animals in the wild. The zoo centres on the primates, but the bit that really hit home for me was the Amur Leopards where they estimate only about 50 animals living in the wild. 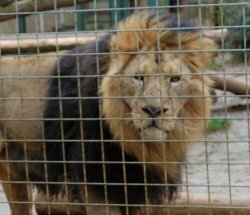 Most of the animals seamed very happy with their enclosures which were spacious and full of natural features or toys to keep the animals occupied. Not being an animal behaviour phsycologist it would be easy to misread animals behaviour, but the only one that didn’t look happy is one of the lions which just seamed to be pacing up and down on the same spot. I’m not sure what this really means, or how this would compare to being in the wild. At the very least at least it’s safe from poachers in the zoo. General access with the baby was OK. There was one building that was a bit too narrow for the pushchair and that was acknowledged on the door. The paths around the site were gravel which was a bit hard on the pushchair at times, but nothing too bad. There is some shelter from the elements for visitors whilst in the animal houses, but going between them you are open to the elements. There is also a small funfair, unlike some other places this is just a small feature compared to the zoo, which is good in that it keeps the zoo as the main feature. In general a good place to take babies and children. This entry was posted on Thursday, March 2nd, 2006 and is filed under Babies, Coventry West Midlands, General, Tourism. You can follow any responses to this entry through the RSS 2.0 feed. Both comments and pings are currently closed.